giving | Agile KM for me… and you? “Giving a gift makes you indispensable. Inventing a gift, creating art-that is what the market seeks out, and the givers are the ones who earn our respect and attention.” (Seth Godin,). the book is worth exploring from an agile KM perspective. 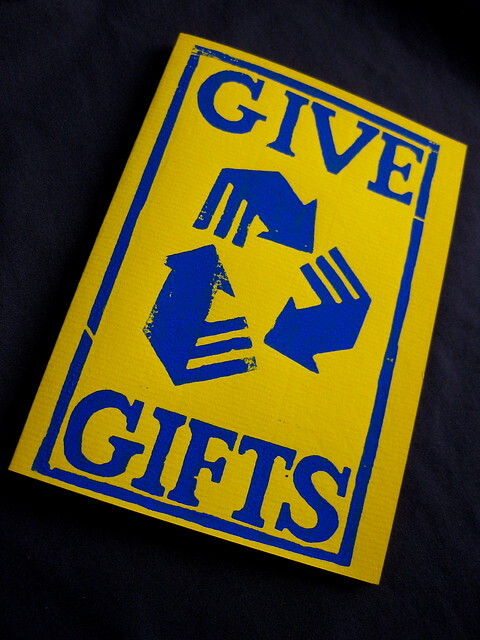 Godin talks about the gift economy, or rather the gift and the social economics around it. This is a final opportunity to put to rest the idea of ‘knowledge is power’ (among other reasons for not sharing knowledge) and to focus on the knowledge ecology our world can and should replace it with. Essentially Godin’s point is that we’ve lost the universal tradition of gifts – in most human societies gift had a place and the person sharing the gifts was the person that earned the respect. The commodity-focused capitalism has replaced gifts with economic transactions – paying for a good – and has turned the tradition of gifts to become a tribute. The person with power became the person getting gifts, not giving them away. However the social economy we are in is now turning this on its head again and making space for the ‘linchpins’ – the indispensable positive deviants that are following their passion, developing their art (regardless of the reactions expected) and thus making themselves indispensable. And one of the things that linchpins do is to share their gifts again as they connect with people around them. All those behaviours are the key to success. ‘Knowledge is power’ states that there is more advantage in hoarding knowledge for one’s advantage than sharing it freely. And that might be true. For a while… A short while. In the longer run, however, we thrive as we are connected to a vast network of people. 1. ‘Selling’ knowledge is a zero sum game. When someone is hoarding knowledge, no fertile work comes out. And when someone systematically and only charges for sharing their knowledge, that person is merely entering into a transaction. Commoditising knowledge, with all the problems that come with – one of them being that knowledge really isn’t a commodity. But if it is considered a commodity, knowledge becomes desacralised, stripped off of its power which is unique and close to only a few other importants things in life, like love. That power is its social nature. In any case, when we are selling knowledge there is no transformation, there is no(t much) added value here. Indeed, when we share our knowledge, not only do we make available that handy knowledge to others, for them to do something perhaps useless but perhaps useful, or even amazing. In addition, and whatever happens with that knowledge, something else happens: when we share gifts (of knowledge or otherwise) with specific people, we are also developing, changing, transforming our relationships with them. We expand our tribes, we bring people in them. We also reach out to the people in the tribes of our tribe members – and so we are connecting to all the nodes of our global collective brain. Of course, for this social transformation to happen most completely, there needs to be some sense of appreciation from the person receiving the gift too. That’s where the gift of your attention becomes so precious. And perhaps why your engaging in conversations (because that’s the work) is essential too. One of the final points of Godin is that the person giving the gifts is showing that they have plenty of potential to give more, plenty of creativity, plenty of art to share. They show their uniqueness, and that uniqueness is also power – not that I would encourage you to focus on this. But indeed ‘Knowledge sharing is (caring) power‘ – both collective and individual. This goes to show that even in a knowledge ego-logy, where we are serving (also) our own interests, but out of the principle of sharing our gifts, we are cultivating the knowledge garden and we are cultivating our connections with each other in that whole ecology. Develop your art with passion – in the knowledge world this means developing learning approaches that have failed safely and keep on going higher because you drive them with all of yourself. Stop hoarding knowledge – share it and pay it forward instead, as it’s the best way to get that knowledge to lead to grand work, art crafts, masterpieces! Offer your respect in return: part of the ecology is to cultivate it too by paying respect to the artists around us who are sharing their art as gifts. Trust that people are not so interested in buying products, but as Seth Godin points out, they are interested in “relationships, stories, magic“! I’m on to seek my next Godin book now… Any recommendation? I share because I care!